Customer Relationship Management (CRM) is a great way of maintaining a healthy and friendly relationship with existing, new and prospective customers. In addition, it even helps a company strategically by enhancing its productivity while improving customer satisfaction. In short, it doesn’t only retain existing customers but, also attracts new customers on board. Well, this is the reason more and more companies are jumping in this CRM software bandwagon. In fact, in order to leverage the most out of it, companies across the globe are opting for CRM outsourcing. To put it in other words, with 40% of CRM applications being hosted in the cloud, it is quite visible that the trend for CRM software outsourcing is on an all-time high. In fact, a lot of businesses are using software outsourcing services for their customer relationship management. However, despite its popularity, few businesses are still apprehensive to hire outsourcing team for managing the customer relationship. So, the big question remains that “is outsourcing CRM software services an effective strategy”? Well, the answer is a definite yes. From faster market time to getting hold of better software, using software outsourcing services can help you achieve it all and have a desired edge over competitors. 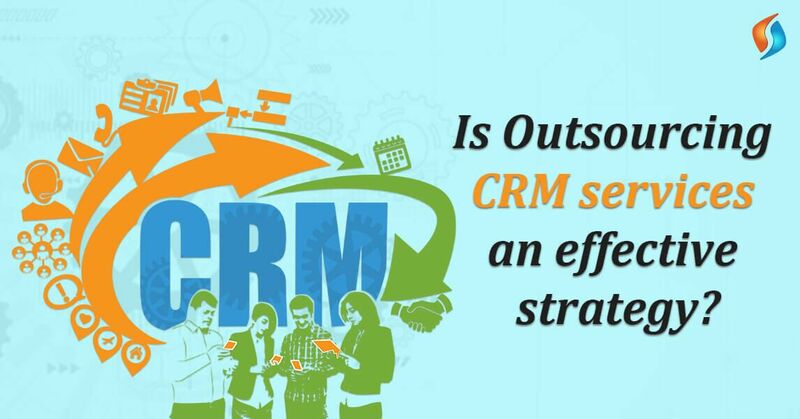 Still doubtful about incurring the outsourcing strategy for your CRM? Here are it’s long term benefits. Take a look. The expertise and quality that a software outsourcing company offer remains unmatched. In fact, delivering quality services is the forte of these companies. This happens for the reason that these companies provide rigorous and continuous training to their employees regarding the latest trends and activities. In addition, they even invest in high-end technologies for supporting and facilitating multi-user communication involving emails, social media integration etc. And with such great expertise and highly skilled professional, managing your CRM would be an easy task for them. This, in turn, would help you attract new customers and retain the existing ones. The adaptability level of an offshore outsourcing software development company is extremely high which is seldom found in any in house team. From adapting to a plethora of customer demands to preventing backlogs by making extensive use of redundant call centers, they do it all like a pro and give your customers the best of client experience. Outsourcing CRM services can speed up and fasten the whole process of adapting to new skills and resources. This, in turn, works wonders for extracting the best quality of work from the outsourcers at the most reasonable price. Customer relationship management is all about round the clock customer support. This is where outsourcing CRM development services can come in handy. Yes, one of the major benefits of outsourcing is the differential time zones. Since the whole system is remote, the employees are available 24*7 without any hindrance. And with such prompt availability, managing CRM is a very easy task. While outsourcing your CRM is economical on one hand, it is a smart decision too on the other hand. Yes, you heard that right. When you outsource, you share the burden and responsibilities of your project with your outsourcing partner. This, in turn, lets you keep your focus intact on your core responsibilities. In fact, it will release out a lot of pressure from your in-house employees and make the whole workplace more productive and happier. All in all, it will help your staffs give their time on their strength and thereby extract the maximum benefits from their skill and talent. Either you choose Salesforce CRM services or the Zoho CRM services, outsourcing gives you the freedom to choose from multiple service provider. From an expert with the most skill to a specialist with the most optimum price, outsourcing gives you varied options to choose and cater your CRM needs. Since outsourcing allows you to collaborate and partner with global outsourcers, it will help you improve your creative and innovative abilities to a great extent. Furthermore, it also helps you get the first-hand experience of the latest technologies and huge intellectual capacity. Another major benefit of CRM outsourcing is huge cost savings. Yes, when you outsource, you don’t need to invest in infrastructure or employee recruitment and training. These resources are already available with the outsourcing company. In fact, they possess state of the art labs and skilled labor who are competent enough to manage your CRM and accelerate your sales like never before. In short, it wouldn’t be wrong to say that outsourcing helps to manage your CRM budget properly. And, that’s exactly what you need to generate a huge ROI while being successful in the long run of your business. Hire the best CRM software development company in India! In summary, CRM software outsourcing can be your gateway to customer satisfaction and success. From lower employee turnover to high profits, software outsourcing services can give you everything in an optimum budget. The trend for CRM outsourcing is growing day by day. Earlier only small and mid-sized companies used to extract its benefits. But, with its numerous advantages, even the large-sized organizations are jumping on this outsourcing bandwagon. So, if you want to get the best of CRM services too, opt for outsourcing. Research well and choose the one that best suits your need. In this context, Signity Solutions can be your one-stop destination for outsourcing to India. We are the leading custom web and mobile app development company in India. We have the adequate skills and expertise to cater to all your outsourcing needs. For any queries and information, feel free to reach us. We will revert at the earliest.